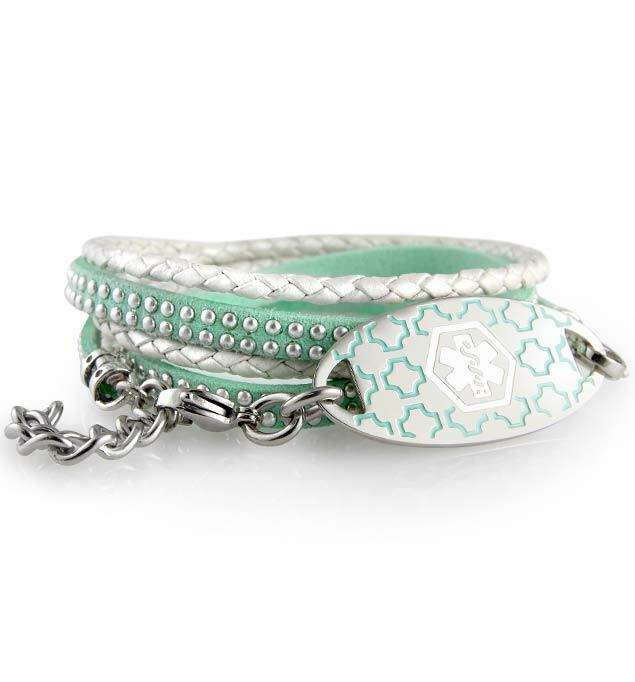 Corey is a dual-strand, wrap-style, ivory and teal suede medical ID bracelet with silver accents. The Corey medical ID wrap comes with a custom-engravable medical ID Tag. All of our wrap bracelets feature a custom-engravable medical ID tag so you can wear it just the way you like! Whether you or your loved ones wear a medical alert bracelet for food allergies, heart conditions, lymphedema, autoimmune diseases, blood thinner use, or any other medical condition or treatment consideration, wrap bracelets are a terrific option. Adjustable and on-trend, these leather medical ID bracelets feature custom-engravable medical ID tags, so they’re truly made just for you. *Please review the Sizing Guide before ordering this item to ensure a great fit.